We are so pleased to announce that the inaugural holder of the Alice Munro Chair in Creativity will be Nino Ricci, who will be at Western starting July 1, 2018. The creation of this Chair was made possible through the generous support of many alumni and friends who wished to recognize and honour Alice Munro’s creative accomplishments and achievements as a Nobel Prize winning writer and story teller. Nino Ricci’s first novel was the internationally acclaimed Lives of the Saints. It spent 75 weeks on the Globe and Mail‘s bestseller list and was the winner of the F.G. Bressani Prize, Books in Canada First Novel Award, and Governor General’s Award for Fiction. Published in 17 countries, Lives of the Saints was the first volume of a trilogy that was later adapted for television as a miniseries starring Sophia Loren and Kris Kristofferson. Nino is the author of Testament, The Origin of Species, Pierre Elliott Trudeau and his most recent novel, Sleep, published in 2015. He has served as writer-in-residence for the Toronto and Kitchener public library systems and for the University of Windsor and the University of Toronto Scarborough.He has held the Mariano Elia Chair at York University, the Chair in Religion and the Arts at Assumption University, the G. M. Hopkins Chair in Literary Studies at John Carroll University, the Killam Visiting Professorship in Canadian Studies at Bridgewater University, and the Pathy Visiting Professorship in Canadian Studies at Princeton.A recipient of the Alistair MacLeod Award for Literary Achievement, Nino is also a recipient of York University’s Pinnacle Achievement Award, the Engel/Findley Award for a Writer in Mid-Career, and an honorary doctorate from the University of Windsor. In 2011 he was appointed a member of the Order of Canada. Nino is also past president of PEN Canada. We are absolutely delighted that Nino will be coming to Western. The Alice Munro Chair in Creativity will recognize and honour our Nobel laureate, inspire student writers and foster creative expression of all kinds. Alice Munro is counted among the University’s most extraordinary alumni. Her first connection to the Department of English came while she was an undergraduate pursuing an English major. In 1976, the University recognized Munro’s literary achievements with an honorary degree, the only such honour she has ever accepted. In October 2013, Munro was awarded the Nobel Prize in Literature. 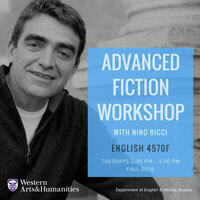 · Present the annual Alice Munro Lecture on Creativity. Stay tuned for Fall 2018 events including public readings and more!